Continuing with medieval background articles, I saved the topic of disease toward the end as I had not a clue how this should be integrated in a campaign setting. Die rolls, event cards, catastrophe tables were possibilities, but as I gleaned information the answer became clear. Let us first look at the scope of disease in this period. 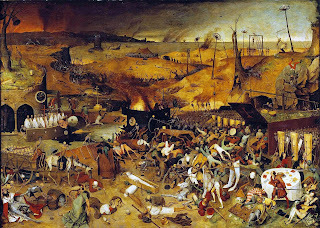 The most notable affliction, the Black Death was the most devastating; some suggesting between 75 million and 200 million people became victims in the period of 1348 and 1350. Although the event was a half century before the start of our campaign, the plague repeatedly returned to haunt Europe and the Mediterranean throughout the 14th to 17th centuries. In 1466, perhaps 40,000 people died of plague in Paris. During the 16th and 17th centuries, plague visited Paris for almost one year out of three. 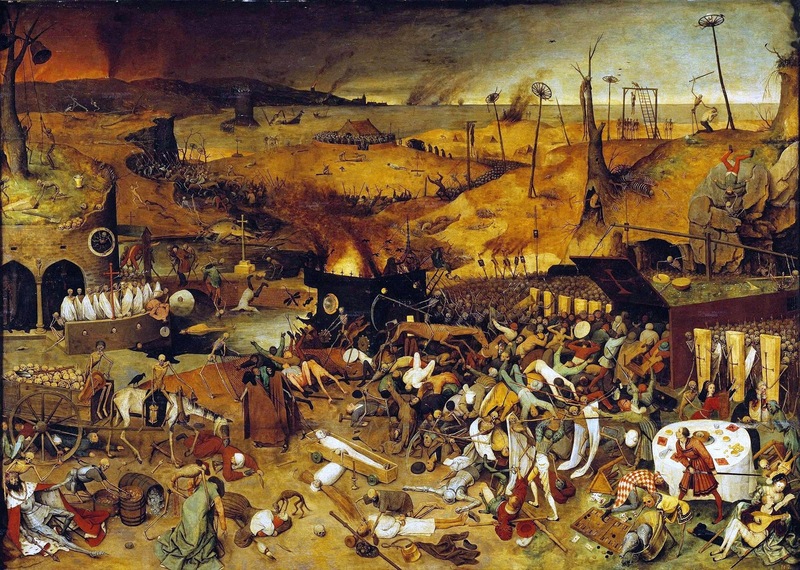 From 1348, the Black Death ravaged Europe for three years before it continued on into Russia, where the disease hit somewhere once every five or six years from 1350 to 1490. Its periodic occurrence was due to rapid urbanization of cities which became a breeding ground among the filth, decay for all sorts of vermin and parasites. Pneumonia was prevalent as cold, drafty dwellings led to numerous cases during hard winters. In warm weather, improper sanitation made typhoid a constant problem. Mental illness was also widespread during the middle Ages. Injuries received to babies during the birthing process often led to brain trauma. Little could be done for these people, but there were no institutions for them and many were accepted into society. Others, however, would have crosses shaved into the backs of their heads, or be tied to pews in the church in hopes that mass would bring them relief. Medieval men and women reaching the age of 45 were considered "old", however, the average life-span was somewhere between 30 and 35 years. This number is said to have dropped all the way down to eighteen and twenty years after the introduction of the plague in 1348. Variation of age was subject to factors like poverty, wealth, city dweller or rural inhabitant. While the ancient diseases of pneumonia, tuberculosis, and smallpox, and others including typhoid, diphtheria, cholera, malaria, typhus, anthrax, scarlet fever, measles, epilepsy, trachoma, gonorrhea, and amebiasis persisted throughout this period, many of which were related to deficient diet. Life in the medieval period became a vicious circle in which hunger and chronic disease reduced the productivity of the peasantry, freemen and others alike. In an agrarian and mercantile society, this had dire consequences. We generally avoid using event cards or tables to determine a moment of decision. Depending on the frequency of moves, when do you roll the die or draw a card to represent an event? The DBA campaign option is based on seasonal moves (double). We prefer monthly, which is fine for recording anomalies within the expected cycle of the year. An early thaw with a steady warm period and sufficient rain can generate an increase in harvest, whereas a prolonged winter can produce the obverse, a meager harvest. Aside from the economic consequences, a second such year would lay the basis for a possible famine. As we have read above, after famine, disease followed. For the campaign designer, the game gathers a realistic luster if changes become logical and force the player to make hard decisions he/she would normally not make with a one off game. Crippled by famine and the economics thereof, a player may seek a loan with an exorbitant interest rate, consent to an alliance or if at war, sue for peace. 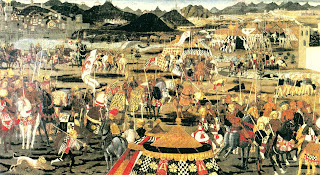 In the period following the Black Death, we noted similar events took place every five years, but on a smaller scale. The plague would make its presence felt after a year or two of famine. Note: Pneumonia would strike hardest during the winter months and contagions or plague during the summer period. Next posting, the cures or Medicine. Wallachia is situated between the Danube and the southern edge of the Carpathian Mountains. Established as a principality in the 14th century, Wallachia gained independence from Hungary shortly thereafter, but this was short lived. After 1417, the Principality of Wallachia became part of the Ottoman Empire. The drive toward independence was realized during the reign of Viovode Basarab. The decisive victory at Posada in November 1330, over King Charles I of Hungary, solidified her freedom. 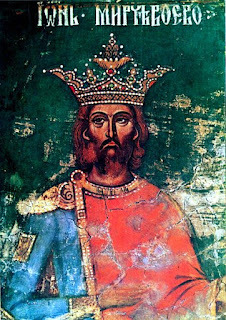 Sealing her independence, Basarab’s prestige increased further by placing his son-in-law on the throne of Bulgaria in 1331. Following the Byzantine model of government, Wallachian princes exercised absolute power. They were the host commanders, supreme judges, patronized the church and made decisions that became laws. Although a dynastic monarchy, the princes were elected by the boyars of the ruling family, however, the boyars, the landed aristocracy, slowly lost influence as the princes granted favoured persons privileges having similar status. As neighboring lands fell to the Ottoman Empire, Wallachian sought assistance from multiple kingdoms. Mircea the Elder, grandfather of Vlad Tepes, accepted the suzerainty of Poland in 1387 and of Hungary in 1395. Mircea’s reign strengthened the power of the state. New offices were organized, increased economic development moved ahead and trade with the merchants of Poland and Lithuania flourished. With the increase revenue, Mircea was able to flex his military power and fortify the Danube citadels. Renewal of treaties with Hungary and Poland ensured focus on the common threat, the Ottoman expansion. Mircea’s intervention, supporting the Bulgarians, brought him in conflict with the Ottomans. Sultan Beyazid (the Thunderbolt) crossed the Danube with 40,000. With less than 10,000 troops, Mircea used guerilla warfare to maximum effect. On October 10, 1394, the armies clashed at Rovine, a forested and swamp area which inhibited the Ottomans from fully utilizing their superior numbers. Despite a glorious victory, Mircea was forced to fall back to Hungary as Vlad Uzurpatorul had seized the throne. While exiled in Hungary, her monarch called for a Crusade against the Ottomans. Contingents from as far away as France, the Holy Roman Empire, Genoa, Venice and Bulgaria assembled and crossed the Danube. The Battle of Nicopolis ended any hope of the Crusade flourishing. In 1397, with the help of Hungary, Mircea defeated Vlad the Usurper and stopped further Ottoman encroachment across the Danube. Further expeditions by the Ottomans met with no further success. The summer of 1402 began a period of anarchy when Sultan Beyazid met defeat by Tamerlane at Ankara. Subsequent campaigns further strengthened Mircea’s power and toward the end of his reign, the Ottomans settled a treaty with tribute to halt any further attempts to make Wallachia a province of the Ottoman Empire. 1 x rustici (Wb or Ax) or voynuks (Bd) or archers (Ps). I have constructed a series of smaller houses to assemble as a hamlet for our DBA 3.0 games, but wanted to build something that could represent commercial activity, a town. Photo one, shows the pink foam board cut into rough form; structure body is separate from the gable roof. These were glued together and given an undercoat. With a hard pencil, I sketched the timber frame, windows and doors and in some cases stonework. Painting the windows first, I followed with grey for all the stone work, and for the larger areas, I offset this by using pastel colour. With a steady brush stroke, I painted the timber frame and highlighted were needed. The embossed roofing is from Vollmer. Completed structures were paired, glued to their bases, groundwork applied, painted and flocked. Total time to complete, one day. Trento is located at the very most northern part of Italy; nestled between the fir covered slopes of the river Adige river valley all traffic southward bound from the Brenner Pass would quickly encounter the fortified walls of Trento. Situated on the border, Trento quickly became the playing field between Bavarian, Tirol and Verona during the centuries preceding our campaign. Tirol’s claim strengthened when in 1363, Countess Magaret "Maultasch" offered her lands to the House of Hapsburg It would take 62 years of defying Hapsburg threatened subjugation, appeals to the Holy Roman Emperor and a resort to arms, that Trento would be declared a commune. 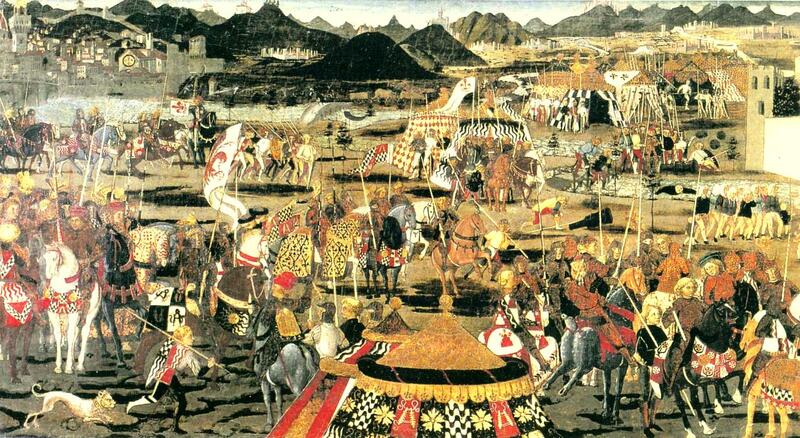 Italy was the first to flex her urbanization and commercial muscle during the 11th through the 13th century. Trento was ideally placed to profit from commercial traffic moving between the Holy Roman Empire and the Italian peninsula. From this period, Trento was under the rule of Count-Bishops which created divided loyalties. 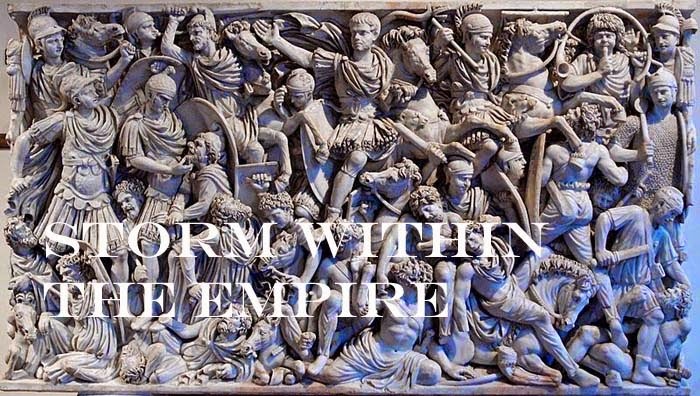 The ecclesiastical power required loyalty to Rome, while the Counts acceded their authority to German administration. A sign that the Counts were winning a point was the adoption in 1339, of the Eagle of St. Wenceslas was assigned to the city arms by St. Nicholas of Brno. 1 x Archers (Ps) or Art.